A beer style is basicly a type or variety of beer, and the range of beer varieties in Germany is huge: Alt, Bock, Dunkel, Export, Hell, Kölsch, Lager, Malzbier, Märzen, Pils, and Weizenbier, to name just a few. These brews differ in the ratio of ingredients, brewing temperature and technique, alcoholic content, aging time, color, and taste. On the beer label, German brewers often use add an adjective to the beer name to highlight a unique characteristic of their beer. Here, we list some of those beer terms to help you choose the perfect beer. Spezial Refers to a "special" beer. This could be a special seasonal beer or just simply one that the brewery considers particularly good. Edel Refers to beer that has been made with a superior variety of hops. The best varieties of hops are called "Edelhopfen," meaning superior or noble hops. Ur / Urtyp Refers to a beer made according to an original recipe. Hell / Helles "Hell" means light. This does not, however, refer to a low calorie beer, but rather a beer that is light in color. A lite beer, one that is lower in alcohol or calories, is labeled "Leicht." An alcohol free beer is labeled "Alcohol Frei." Dunkel Refers to a dark beer. 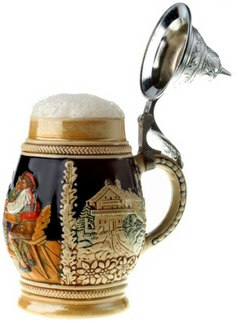 Leicht Refers to a lite beer, one that is lower in alcohol or calories. Alcohol Frei Refers to an alcohol free beer. Here is a list of all the German beer styles that are available in the U.S. To view details of a particular beer style, select its name below.